for the control of resistant ticks and other ectoparasites. Bovitraz is indicated as garrapaticida, sarnicida and piojicida for pigs, bovines, sheep and goats, canines for use in sprinkling and in dip bath. (amitraz) is indicated for treatment of generalized demodicosis (Demodex canis) in dogs. Current data do not support use for treatment of localized demodicosis or scabies. 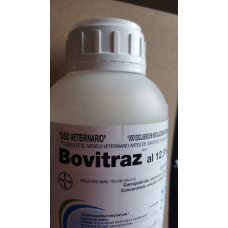 Dilute Bovitraz at the rate of 2 ml per liter of water, bathing or spraying twice a week for up to 7 weeks (if necessary). It is recommended not to rinse and leave the dog in a ventilated place, SUNLESS and able to move (large cage) or walk outdoors for 15 - 30 minutes and then dry (if necessary).